I have just finished my first year at West Dean College studying Conservation of Books and Library Materials, and it has proved as enriching and rewarding an experience as I had hoped. Not only have I enjoyed the course immensely but I have learned a huge amount and as a result feel confident that I can now handle a range of conservation challenges and decide upon appropriate treatments independently. West Dean’s programme certainly throws its students into the deep end – we books students were assigned our first conservation project during the very first week of the course. This was both exciting and daunting, as the objects worked on at West Dean belong to real clients and our treatments must be completed to a very high standard accordingly. Despite being somewhat nerve racking …this has been a great benefit… as it emphasises the need to work with absolute conscientiousness at all times … the upshot of which is that I learned a lot very fast! My first project was working on a half leather volume dating from 1800…there was a lot to be done on the book as both boards were detached from the text block, the spine was split and the leather was very abraded while the end papers were in bad condition. …It was a great moment when I could see the book returning to functionality. I also worked on a Tudor manuscript… which is of particular historical interest as it mentions the Mary Rose. I am immensely grateful to the Anna Plowden Trust for allowing me to take up this wonderful opportunity to study at West Dean. As I continue in my training and career I hope to make a positive contribution to the conservation profession as early as I can. 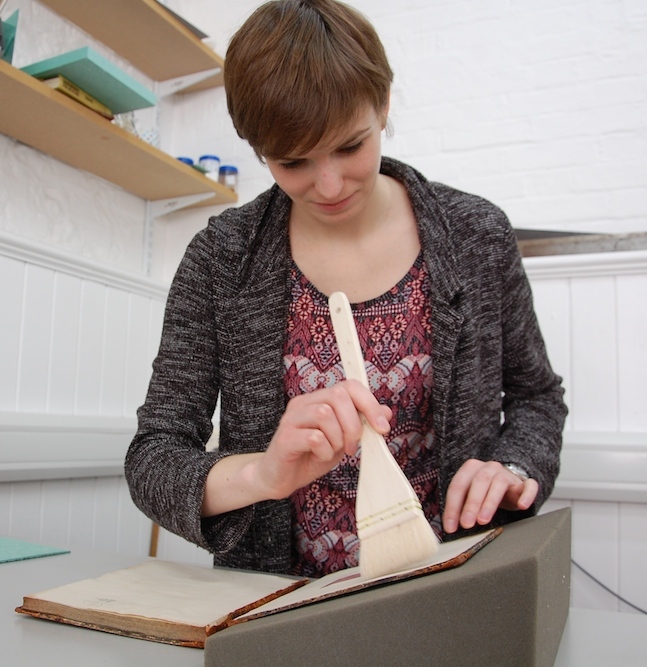 Jessica has recently been appointed as conservator on the project to conserve the Minton Archives, at Staffordshire and Stoke-on-Trent Archives Service.